We are on watch today. We may be losing Gilligan. My husband found him at the bottom of the stairs this morning. He was lying in his own pee and couldn’t get up. 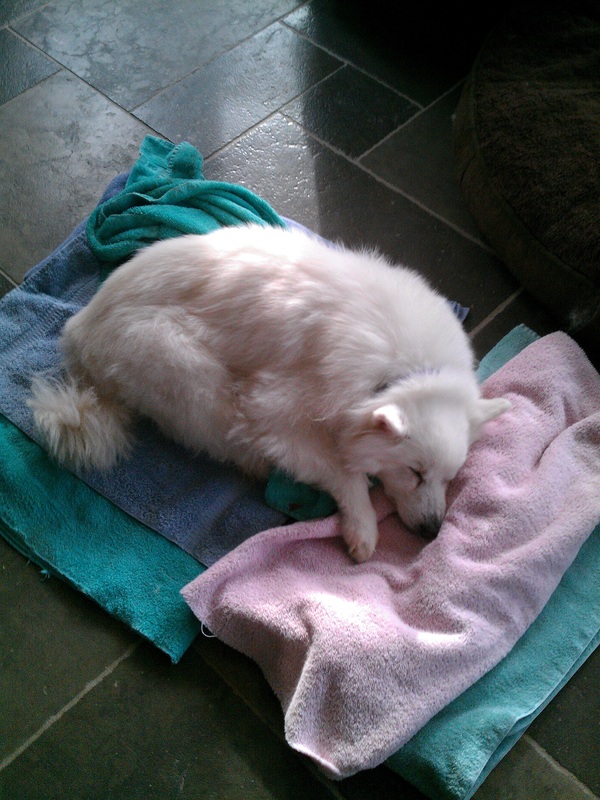 We made a bed of towels in the family room and placed him there so we can keep an eye on him. He doesn’t seem to be in any pain. He just wants to sleep. He rallied a little this afternoon. He drank water and ate some wet food and, with the help of a towel sling, stood up. My husband carried him outside and he peed. He wandered around a bit, but he’s down again and hasn’t been able to get up. We talked about what to do. We are not taking him to the emergency vet. Tomorrow, if he makes it through the night, I’ll take him to our vet. I’ll make th decision then. I love this dog with all my heart He made me work for every bit of affection or obedience I ever got. He is my tough guy, my circus dog. He could not be contained. He was smart enough and atheletic enough to get out of any space. I keep thinking about “Million Dollar Baby”. He is my Mecushla, my darling. I’ll break my own heart for him. This entry was posted in Aging, Daily Life, Death, Dogs, Grief, Uncategorized and tagged aging, dogs, Mecushla. Bookmark the permalink. I hope the best for him and you. Be well. It breaks my heart every time I hear of someone losing their fur baby. It’s never easy saying goodbye, whether it’s just their time or by accidents. My thoughts are for a peaceful passing, and comfort for you.